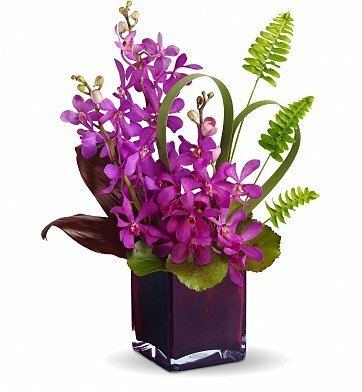 This unique arrangement combines exotic purple orchids and island greenery such as sword ferns and ti leaves. Presented in an amethyst cube vase, it's the perfect choice for escaping from the ordinary. Lush Tropical Greenery and more. Standard Arrangement Measures 12" x 16". Island Princess Bouquet is a hand delivered gift. These gifts are delivered by one of our local design centers located throughout the United States and Canada. Same day delivery is available for most gifts when ordered before the cutoff time. The cutoff time for Island Princess Bouquet is 2 PM in the recipient's time zone. I did not see the arrangement but the sister of the gentleman who died stated it was very nice. The flowers were purple which is her favorite color. She attends our church and the flowers were sent on the church's behalf. They arrived in time which was important to me. I was a bit concerned when they wanted to substitute the flower because the florist didn't have the exact one advertised. But they arrived on time and were beautiful so the order was perfect. My sister was thrilled with this get well gift and had many people comment on it when they came to visit her. Thank you. Excellent service - arrived the same day! Daughter was delighted with them. Looked big & beautiful in the pic I was sent...very special orchids & elegant design. These were a gift for a friend who'd just had surgery. She absolutely loved them. The color was stunning and the arrangement was gorgeous. She couldn't stop talking about them. Really beautiful. I would highly recommend these flowers and the service! My daughter was very pleased with the arrangement. I was a bit disappointed that the orchids were closed rather than open and hope that they open with a few days. Since I do not know how orchids open this may turn out to be an advantage. However, the use of eucalyptus and bamboo instead of the ferns gave it great look and will last longer than the ferns so it was a successful gift! The orchids were pretty, but a little wilted looking. It was a cold day, so it may have been because of cold. Please know that your service was terrific and I have already recommended you to a family member. Thank you for your help and follow-up. The flowers were for the funeral of my brother-in-law, so it was important to have gotten it right. We ordered this bouquet for two different gifts following the loss of a loved one. Both commented on how beautiful it was. One sent a pic and it was very similar to what I ordered. My friend took a picture of this arrangement and it was more exquisite than the picture. She loved it! Thanks for doing a fantastic job. My friend to whom I sent these said that this was by far the most beautiful arrangement she has ever received. I sent this bouquet as a Mother's Day gift and it recieved rave reviews. I sent this to my daughter for her birthday and she said it was absolutely gorgeous! I had it sent a day before her birthday so she would be surprised and she said it made her day. I sent these to my daughter for her birthday. She absolutly loved them. The flowers were a gift for my mother in law, so I didn't see them in person but she said they were absolutely beautiful. She loved the vase and the way the stems were wrapped with the leaves. Very beautiful arrangement. My friend loved it!!! thank you for delivering it on time. it looked exactly as the picture depicted. Not like the picture but better! Very very happy with the arrangement! Didnt know what to get my sister in law for her birthday and someone said Orchids. Saw this on line and purchased them. The orchids were slightly a different color and there were added exotic flowers added.